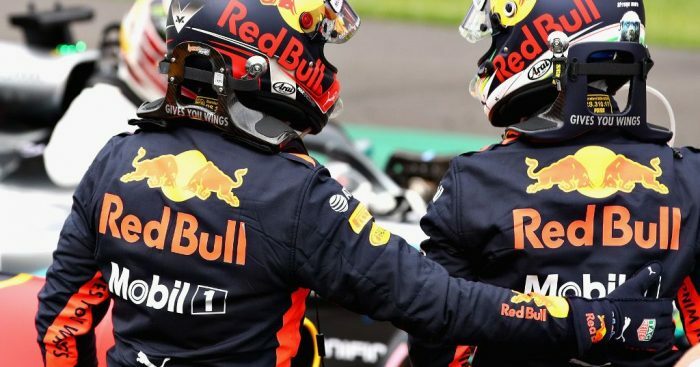 Daniel Ricciardo says his exuberant pole position celebrations in Mexico were never designed to “piss” off Max Verstappen, he was just “super happy” with his P1. Dominating the weekend’s practice sessions, Verstappen was the favourite to claim pole position for the Mexican Grand Prix. If he did so, he would be the sport’s youngest ever pole position holder. But it wasn’t to be as Ricciardo put in a flying lap out of nowhere to take pole by 0.026s. Verstappen was second. It was, however, the Dutchman who had the last laugh as he won the grand prix while Ricciardo retired with yet another mechanical issue. Verstappen’s father Jos said later his son had been spurred on by his “anger” over Ricciardo’s pole position celebrations. The Aussie insists it was never his goal to “piss” off his team-mate. Asked about Jos’ comments, Ricciardo said: “I am not aware of that. I was aware Max was pissed after qualy, the press conference and that you could tell he was not too pleased. “I don’t think it was really directed at me. I think anyone missing their first pole by such a small margin is going to be pissed. “Even if I missed that pole, if I was in his shoes, even if it was not for my first pole, I would still be upset. That is the competitor in us. As for Verstappen, he says he was angry at the situation, not his team-mate. “I was mainly very angry because of the problems I’ve had with my engine during qualifying and then you know, that weekend I was clearly the fastest but just for 75 seconds I wasn’t. So yeah I was literally pissed off. “Then of course every little thing which comes with it makes me even more angrier, I could literally… I prefer not to say.